The Porsche Carrera Cup GB, the fastest single marque GT racing Championship in the UK, has announced the highest number of competitors confirming their entry before 31 December in its history. In a development that underlines the appeal of the 2017 package for teams and drivers, which includes a headline race alongside the Le Mans 24 Hours in June, the attraction of 20 early registrations so far clearly builds on the success of the 2016 Porsche Carrera Cup GB season. Leading the charge will be 2015 and 2016 Porsche Carrera Cup GB champion Dan Cammish (27, Leeds). Following a record-breaking 12 wins in 2016, Cammish has announced his intention to challenge for an unprecedented third title in the UK’s fastest single marque GT championship. The Yorkshireman’s 2017 campaign will continue his successful partnership with Redline Racing (Stockton on Tees), which clinched its 100th Porsche Carrera Cup GB race win earlier in the year. However, a talented mixture of new and returning competitors could make 2017 one of the toughest seasons yet. After claiming two championship titles in the last three years, 2016 Michelin Ginetta GT4 Supercup champion Tom Wrigley (24, Chirk) will take the next step in his career by joining the Porsche Carrera Cup GB Pro and Rookie categories with IN2 Racing. In a parallel move, Ginetta front-runner Jamie Orton (36) will be entering the Pro and Rookie categories with Team Parker Racing (Leicester), both drivers following in the footsteps of 2016 podium finisher Tom Oliphant (26, Leamington Spa) who made a similar move last year. A returning driver with his eyes firmly on the title will be Porsche Carrera Cup GB 2016 / 2017 Scholar Charlie Eastwood (21, Belfast). Buoyed by taking this year’s Rookie title and his first race win, Eastwood was one of only three drivers to taste overall victory in 2016 and will resume his place in the Redline Racing team alongside Cammish. Joining this exciting pairing at Redline Racing and stepping up into the Pro category for 2017 will be brothers Euan (21, Edinburgh) and Dan McKay (25, Edinburgh). Both showed strong pace and racecraft in their debut seasons, taking first and second in the 2016 Pro-Am1 category respectively. Newcomer JTR – led by Porsche Team factory driver and 2015 Le Mans winner Nick Tandy - has confirmed its first driver-signing as Lewis Plato (23, Billericay), the 23-year-old having placed third in the Rookie championship in 2016 and bringing a season of experience with him. Other confirmed entries include the G-Cat Racing pairing of Shamus and Peter Jennings (Pro-Am2 and Pro-Am1 respectively), together with Pro-Am2 competitors Peter Parsons in the Race Car Centre entry and Iain Dockerill with Asset Advantage Racing , all podium finishers in their categories in 2016. Despite all eyes looking towards next year, celebrating the end of a successful season was the theme of the Porsche GB Night of Motorsport, held last month. Over 200 members of the 2016 Porsche Carrera Cup GB family gathered in the heart of Liverpool’s historic dockyards to recognise the champions and stand-out performances of the season. Notable highlights were a standing ovation for Dan Cammish when he collected his second championship trophy in two years, and the ‘Sacred Most Improved Driver of the Year' award going to Alessandro Latif. There were more than trophies to collect, however. Four Superfast Automatic timepieces, presented by Chopard, were fittingly awarded to the driver in each category – Pro, Pro-Am1, Pro-Am2 and Rookie – who achieved the highest number of fastest laps throughout the 16 race season. For Dan Cammish and Euan McKay, the most obvious spoils of winning the Pro and Pro-Am1 categories respectively were outside next to the red carpet. Both drove away brand new Porsche 911 Carreras for a year, and team champions Redline Racing a Porsche Cayenne. The evening also gave an opportunity for the Porsche Motorsport community to acknowledge Porsche Club Championship representatives alongside the newest addition to the family, the Cayman GT4 Clubsport, and the drivers who took it to success in its debut season. 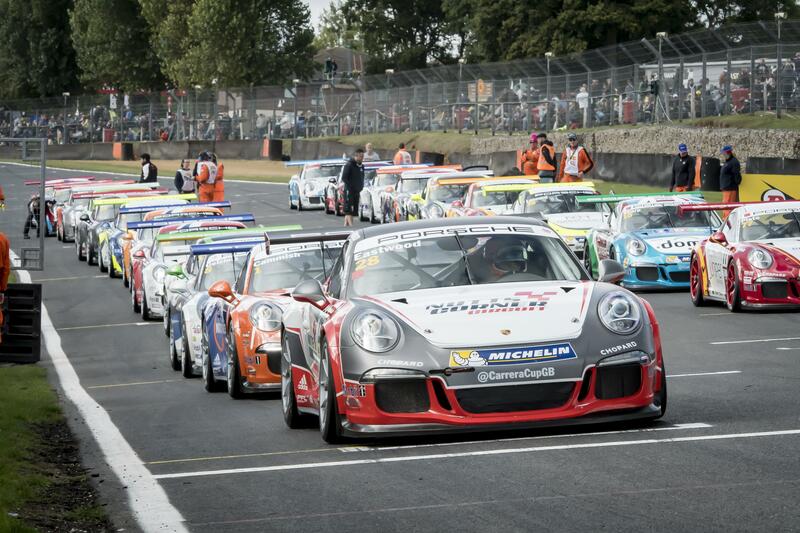 “For us the focus has always been to maintain the growing momentum we have with Porsche Carrera Cup GB. 2016 has been another year of strong grids, great racing and big audiences. There was a lot of positivity at our awards night and it’s been very rewarding to see an unprecedented number of drivers taking up the early registration opportunity. This vindicates the collaborative and evolutionary approach we’ve taken with 2017, the appeal of racing at Le Mans and the position our championship has within UK motorsport.